Corporate customers and software developers were unable to access Microsoft’s MSDN benefits portal for much of today. The portal provides MSDN subscribers with access to downloads of Microsoft products and license keys. Although Microsoft has not issued a statement about the problem, the problem came to light in The Hypervisor Lab when one of our staff tried to access the MSDN download site to obtain an evaluation copy of Windows Server 2008. 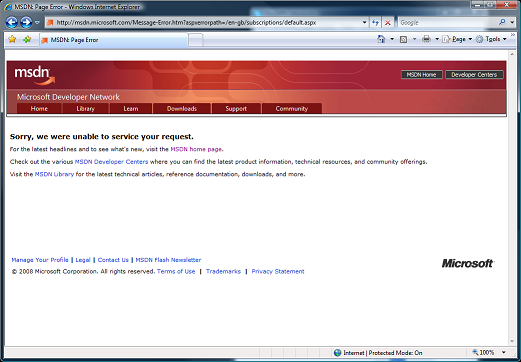 We call this Microsoft's sorry web page. Although they could get to the front page, clicking on the link to download software and license keys resulted in the sorry error message. For our part we found service on the web site was intermittent. While we saw the error message most of the times that we tried to access the portal pages, we were occasionally able to make a connection. The MSDN site is probably running on Windows Server 2008 software. This article was published on Monday, February 16th, 2009 at 6:36 pm. You can follow any responses to this article through the RSS 2.0 feed.